I came back today after who knows how long. I'm surprised I remembered my login info. I had been doing research for the WayBackMachine and thought it would be cool to post something for anyone who drops by. The last person I saw post was Jessie over a year ago. If anyone stops by again and reads this, feel free to message me to catch up. I'll try to be back on again someday. Considering this website is over 10 years old now and a huge part of my youth, I'd like to reconnect to those who remember me. i have used the waybackmachine for many babw related activities. can you share what you are researching for them? a couple of games still work. 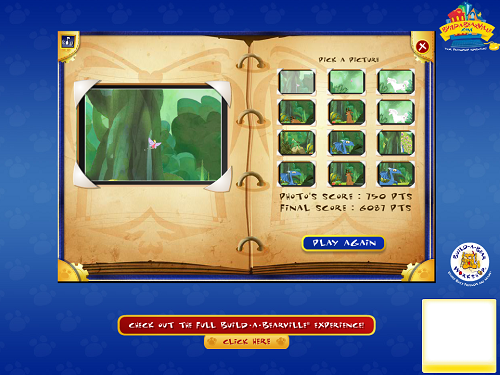 if http://web.archive.org/web/20160820050728/http://ak.imgag.com/imgag/product/full/w1/3149126/graphic1.swf is opened in ie with flash enabled, get to sample buildabearville. can play in 1 condo room if go to neighborhood. photo safari if click on right park. and another game at the workshop. not my best score, but you get the idea..
Oh wow, that's actually really cool. It's crazy to think some of the games are saved still.